When John Norum left Europe in 1987, he immediately jumped on a solo career and released a his first solo album, Total Control the same year. He had some huge hits, at least in Sweden, with songs like “Let Me Love You” and “Love Is Meant To Last Forever” and he went out on a very successful tour with his band that consisted of co-lead vocalist Göran Edman (Yngwie Malmsteen, Madison), bassist Marcel Jacob (ex – Yngwie, who wrote most of John’s debut and went on to form Talisman) and drummer Hempo Hilldén (Trash). He then split that band up to form a new band with ex Deep Purple bass player / singer Glenn Hughes, but Hughes was still battling his drug addiction and wasn’t in shape to do anything. So John joined Don Dokken’s band, released the disappointing Up From The Ashes (1990), but that album flopped and John reunited with a more healthy Hughes to release the brilliant Face The Truth (1992). But the quality on John’s solo albums started to fade already on album number three (Another Destination, 1995) and since then his albums got worse and worse. The fact that Norum needs a sidekick when it comes to songwriting has become very clear. John also reunited with Don Dokken, this time in the band Dokken in 2002, for the very underrated album Long Way Home. When Europe reunited in 2004 as a much heavier unit than in their heyday, Norum stood as a co-writer with Joey Tempest on almost all of the songs and it worked splendidly. But just because Norum is once again a member of Europe doesn’t mean that he quit his solo career. The news that a new album was on its way didn’t exactly make me jump up and scream in sheer joy. Quite the opposite. After John’s latest solo releases I couldn’t really understand why he bothered to release a new one. That’s why this album is a pleasant surprise. First of all, Norum has found his way home. The grunge metal undertones of his latest releases are, thank God, gone. Instead Norum has concentrated on doing what he does best. Melodic and bluesy hard rock with lots of grooves and hooks. ”Let It Shine” and ”Red Light, Green High” are both catchy blues rockers that, at least put a smile on my face. To say that John is a huge Thin Lizzy fan is an understatement, to say the least. Over the years he has covered such songs as ”Wild One”and ”Opium Trail” and this time he put his claws into a real old Lizzy tune, ”It’s Only Money” and the guy really knows his Lizzy and he does their songs justice. Well done! We all know that John is an excellent guitar player, but his voice are seldom under discussion. Me, I think his voice is very good. Sure, the guy is no Pavarotti, but who wants that? His voice reminds me of John Sykes sometimes and it’s very clear that he has listened a lot to Phil Lynott. He has previously had guest singers like Hughes, Edman, Joey Tempest (yes, he guested on the very Europe-like “We Will Be Strong” on Face The Truth) and Kelly Keeling (Baton Rouge, Blue Murder) and on ”Got My Eyes On You” he lends a helping hand from vocalist Leif Sundin (Great King Rat, MSG and now with Brian Robertson). Sundin is a killer, as usual. A good album, indeed, and a really nice surprise, but there is few tracks that doesn’t really cut it. But this album shows that he is on his way as a solo artist. This is easily his best since 1992’s Face The Truth, although it couldn’t hold a candle to his day job in Europe. 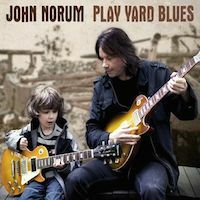 It’s really nice to know that Norum has gotten his solo career back on track.